Continuity is a mind bending stickman puzzle iPhone & iPad app which has you directing your stickman character around a level collecting coins and keys to advance to the next level. If you have ever seen those puzzles where you have to move pieces around a square one at a time to make a picture appear, then you have an idea of the type of puzzle that Continuity 2: The Continuation is based on. Continuity 2: The Continuation is an iPhone app, iPad app and iPod touch application made by Ragtime Games. Yes, it is a sequel, and Continuity 2: The Continuation fixes a definite error that perhaps kept the first Continuity from an even bigger audience than it would have attained at first: Continuity 2 plays on iOS. 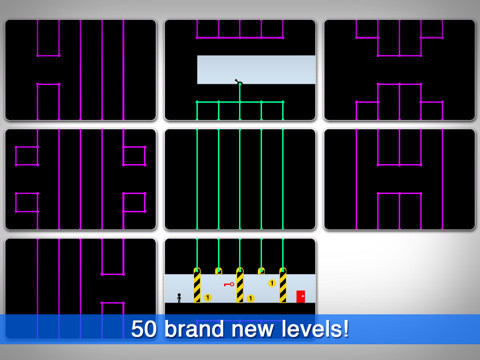 In Continuity 2: The Continuation, the main focus of gameplay is to move the level around you so that your character can continue his way through the game level by level collecting coins and finally getting the key to leave the door at the end of the level. 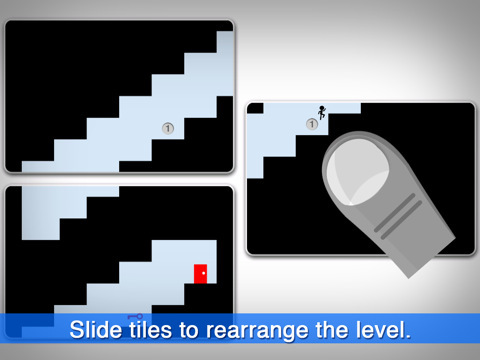 You control your level puzzle by the touchscreen. You can move different tiles in the level around, but you can only move them into positions in which they are continuous. In other words, your character must be able to move into that square that you just moved in order for the move to be legal. You control the movement of your character by dragging on the touchscreen and making a sweeping motion to make the character jump. These movements are not the most intuitive, but after a learning curve, you will definitely get used to it so that the controls are not a hindrance to the gameplay. However, they could be better. The sounds that you get on Continuity 2: The Continuation are top notch. A part of what makes this game so good is the flowing nature of the audio, the graphics, and every aspect of the gameplay. The audio and sounds are a great addition and will definitely enhance your experience. Bring headphones. Graphics are simple, but the same is simple. There is nothing mind blowing here, but then again, the Flash platform has pretty much been taken to its limits by now, and the focus is not on mind blowing graphics, but on the puzzle aspects. Continuity 2: The Continuation is a great value for 99 cents, with great replayability and lots of challenge. This is not a puzzle that you will beat in one sitting, and it definitely requires some time to master. Continuity 2: Ragtime Games continues their indie cred and comes out with a great sequel to one of the best iPhone app, iPod touch and iPad apps to hit the recent market. AppSafari review of Continuity 2: The Continuation was written by Darius Reimm on November 28th, 2011 and categorized under Action, App Store, Featured, Games, iPad apps, Platformer, Puzzler, Resource Management, Universal. Page viewed 3719 times, 1 so far today. Need help on using these apps? Please read the Help Page.